One of the most popular genres of 1970s cinema was a new breed of ultra-gritty drama and action films. William Friedkin's French Connection (1971) and Martin Scorsese's Mean Streets (1973) were dynamic examples of a fresh approach to moviemaking. In many ways, the anti-establishment movement of the late 1960s looked to a wholly different way of approaching films. It was a methodology that often turned a blind eye to cinema's golden era. The studio system had vanished. The early '70s saw the sad spectacle of the once-mighty MGM taken apart, set by set, and sold for auction. However, at the same time the American public was enjoying violent new actioners and raw dramas, they were also yearning for reminders of what once was. A sentimental salute to Hollywood's past, That's Entertainment (1974) and its 1976 sequel proved huge hits at the box office. The Sting (1973) brought 1930s fashions and ragtime music back in vogue. Icons such as Bette Davis and Joan Crawford went on circuit tours appearing before sold-out audiences, showcasing their old clips and taking questions from adoring fans. Television thrillers and horror fare were being made that had a decidedly retro flavor. Films such as The Phantom of Hollywood (1974) and director Curtis Harrington's projects The Cat Creature (1973) and The Dead Don't Die (1975) - as with his earlier big screen What's the Matter With Helen? (1971) - all romanticized the bygone era of Tinseltown. 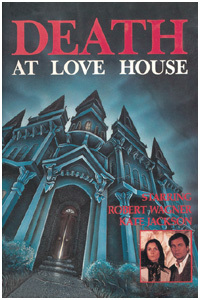 An Aaron Spelling-Leonard Goldberg production, Death At Love House was certainly part of this nostalgic trend and featured wonderful cameos by several Hollywood legends. Originally aired on September 3, 1976, Love House was directed by the prolific E.W. Swackhamer and starred Robert Wagner and Kate Jackson. Jackson had recently finished a successful stint on The Rookies and was just beginning a three-year run on Charlie's Angels, in her Emmy-nominated performance as Sabrina Duncan. No stranger to the horror genre, she had been seen on the innovative soap Dark Shadows as well as its big screen adaptation, Night of Dark Shadows. Her resume also included several TV fright films, among them Satan's School For Girls (1973), the underrated Killer Bees and Death Cruise (both 1974). A tour bus travels through Beverly Hills, its passengers marveling at the beautiful homes belonging to the Stars. The driver (played by Joseph Bernard) stops at one particular thirty-six room mansion that once belonged to Lorna Love. Love, a great film actress of yesteryear, died tragically in 1935 and her embalmed body is sealed in a glass tomb on the property. Joel Gregory Jr. (Robert Wagner) and his expectant wife Donna (Kate Jackson) step off the bus and greet Oscar Payne (Bill Macy), a representative for the studio that has hired them. Together, they go up the long driveway towards the house. Joel and Donna are journalists and are staying at the estate so they can research a book about Lorna Love. It's a project that's personal to Joel. His father, Joel Sr., was an artist who had been in a heated romance and living with the so-called "Goddess of Love." The elder Gregory passed away when Joel was very young and the two men never had a relationship. The grounds have not been well taken care of over the years. There is a housekeeper named Clara Josephs (Sylvia Sydney) who lives on the property but she appears to be inhospitable. Upon entering the home, one of the first things that strikes Joel and Donna is a huge portrait of Lorna painted by Joel's father. Joel Jr. is haunted by it...and Clara attributes the intensity of the work to the great affection that Lorna and Joel Sr. had for each other. And while Clara also mentions that the likeness between Joel and his dad is striking...she refuses to say whether the couple employed her some 40 years before. Joel finds it curious that the master bedroom is locked. Donna sees something unusual from a window: a woman dressed in white running towards the shrine. They don't find the stranger but the sight of Lorna Love's perfectly preserved corpse behind glass is unsettling. That first night, Joel and Donna spend time watching old newsreels of Lorna's funeral and while searching around the library, they discover a stuffed black cat as well as books on the occult. A storm is raging outside and a guest arrives...Conan Carroll (John Carradine) was one of Lorna's directors and he is there to share his thoughts on the actress. Apparently, Mr. Carroll still holds a grudge...he tells them that he made Lorna who she was and that she was ungrateful, later discarding many of the people around her when she hooked up with a mysterious faith healer. It's getting late. The bitter director (who if truth be told, seems crazier than a loon) leaves. But he doesn't drive off the property. Instead, he gets out of his car in the rain and is approached near the shrine by a figure wearing a black hood. Carroll has a heart attack and his body is discovered the next morning. Donna finds a publicity photo in a dresser drawer of her and Joel...it's been cut - and her half of the picture is missing. Next to it is a small ritual knife used for black magic. Meanwhile, Clara the housekeeper has warmed up to Joel. She takes him on a tour of the mansion and into his father's studio, which is exactly as he left it. Donna shows Joel what she found and is upset. She says the house has "too many tragedies and too many secrets" but Joel convinces her to continue with the book. In fact, Donna has a scoop...through the Actor's Guild, she has found Lorna's only true rival, Denise Christian. Denise (Dorothy Lamour) is still working these days and Joel and Donna meet her on the set of a commercial. Like Conan Carroll, her memories of Lorna are not good. She says that her old rival had her blackballed...and that she, Denise, was the person who discovered Joel Sr. working in the studio's art department. Furthermore, Lorna stole Joel Sr. away from her...and he finally broke free from Lorna's grasp after the actress came under the influence of Father Eternal Fire, the faith healer who promised she would never get old or lose her beauty. Joel's father broke all the mirrors in the house after their breakup. Before she goes back to her shoot, Denise Christian warns the couple: "Get out of Love House...there's nothing but death there." This admonition soon hits home when Donna is nearly killed by a hooded figure who locks her in the bathroom and triggers a gas leak while she is in the shower. Joel is becoming increasingly obsessed with Lorna's portrait and nearly misses the opportunity to save his wife. He has visions of his father (Wagner) and Lorna (Marianna Hill) dancing together to a Waltz. Although Donna wants to leave, Joel is adamant that they finish the project. There's another person to speak to. Marcella Geffenhart (Joan Blondell) was president of the Lorna Love Fan Club and she lives in a beach house that was a gift from her idol. Marcella has nothing but nice things to say about the actress. She was "wonderful" and treated her like a "little sister." Among her many mementos is a photo of herself, Lorna and the black robed faith healer. Joel and Donna don't stay long. Outside the home, Donna tells Joel she is sure that Marcella was the woman in white she saw on the walkway that first day on the estate. In the evening, Donna sees her yet again...running towards the shrine. Joel has come across the key to Lorna's bedroom - and Donna finds him on the late actress's bed, hallucinating and calling out her name. Donna has had it. She packs her suitcases and is set to depart. Joel isn't himself and berates his wife, adding, "Now I know why my father was in love with her." While having dinner with Oscar, Donna is told a shocker: after Joel Sr. left Lorna, Lorna conspired with her faith healer to get her lover back. The ceremony involved fire but something went horribly wrong. Lorna was badly burned and never left her home again. Oscar deduces that the entombed body shows no scars because of cosmetic surgery. His advice to Donna is that she go back to the house to save Joel before it's too late. Fan club president Marcella is on the estate. Donna follows her to a hidden chapel set up for black magic services and finds the torn half of her publicity photo with a bloody dagger through it. Even more significantly, she solves the mystery when to her astonishment...she discovers the housekeeper's uniform together with a mask of Clara's likeness. "My God, Mrs. Josephs is Lorna...she's not dead!" she screams. Running towards Lorna's bedroom, she sees a ghastly sight. Joel is on the bed, embracing the actual Lorna Love...her face and body disfigured by burns. Lorna dashes out towards the shrine with Joel in tow. Hoping to keep her ex-lover's son forever, she sets the place on fire. However, her plan is foiled when Donna rescues Joel. As the wax figure that the world believed was Lorna melts in the heat, Lorna finally and once and for all succumbs to the flames. Watching as the actress's belongings are carted off to a museum, Joel, Donna and Oscar are sympathetic toward's Lorna's vain attempt to remain beautiful in the public's eyes. "All she wanted was to be adored, to be worshipped forever," says Joel. Death At Love House (also known as The Shrine of Lorna Love) is a fun movie but it's not without its faults. On the plus side, Jackson shines as usual, and the appearances by Sylvia Sydney, Dorothy Lamour, Joan Blondell and John Carradine are a treat for film buffs. To add to the authenticity, it was shot on the estate that once belonged to Harold Lloyd. The direction by E.W. Swackhamer is sure-handed, while the romantically moody music by Laurence Rosenthal, together with the omnipresent portrait of Lorna, fondly recalls the classic 1944 noir Laura. Swackhamer had helmed the quite enjoyable Death Sentence (1974), but his best telefilm was yet to come: the superlative desert thriller Night Terror (1977) with Valerie Harper. He died on December 5, 1994 in Berlin, of a ruptured aortic aneurysm. Robert Wagner, for whatever reasons, did not make any other horror films. Although he has worked frequently in television and theatrical releases, he is perhaps best known for two series, It Takes a Thief and Hart To Hart. A weak spot in Love House is the integral part of Lorna herself, as told in flashback. Although the character is clearly meant to invoke Jean Harlow, Marianna Hill is simply too modern to come across as a 30s "Goddess of Love." Call this simply a case of miscasting. Then, the viewer must contend with the outrageous Scooby Doo element at the conclusion. But suspension of disbelief is a core essential to enjoyable movie viewing - particularly with horror and science fiction genres.